For more Gamestorming goodness, check out the Gamestorming blog. Information shadows and spimes, originally uploaded by dgray_xplane. 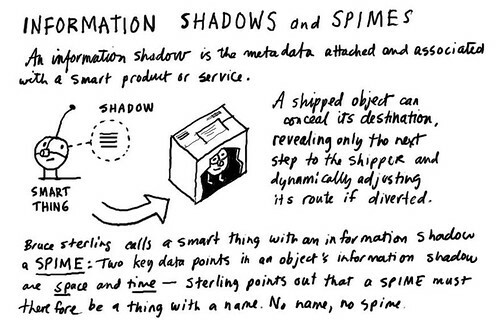 In his book Smart Things, Mike Kuniavsky talks about the information shadow as an essential element of a smart thing. The information shadow is the information that's associated with an object such as its name, number, position in space and time, and so on. Metaphors also help people understand new services by linking the new to the familiar. For example, RFID was first introduced as the next generation of the bar code, even though the two technologies had little in common. Information shadows allow designers to make objects simpler, to reduce the size of interfaces and reduce the display requirements of an object. An iPod shuffle, for example, can be tiny because the information display resides in iTunes, not on the device. Science fiction author and futurist Bruce Sterling coined the term spime to describe an object that can be tracked through space and time throughout the lifetime of the object. This is part of a project called Ubicomp Sketchbook that I initiated with user experience designer Peter Morville, author of Ambient Findability and Search Patterns, in order to explore and explain the ideas aand implications of ubiquitous computing, sometimes called the "internet of things." Check out the whole set.